Like 200 bad pennies, it keeps turning up. The $2 bill, shunned by the American public for decades, could be making a comeback. After seven years, the government is thinking of printing the forgotten greenback once again. "We do contemplate ordering more $2 notes," said Federal Reserve spokesman David Skidmore. The Fed has been talking to the makers of U.S. paper money, the Bureau of Engraving and Printing, about the matter. The Federal Reserve, the supplier of cash to the nation's banks, had a huge pile of the $2 bills stashed away in its vaults back in 1996, when the last batch of the notes were printed. 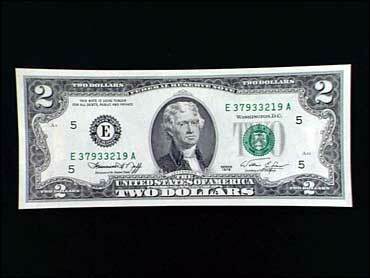 Although the Fed still has a supply of the $2 notes, it's a much smaller one. No one knows exactly why, but some blame the human tendency to make a keepsake of an oddity. "They are collected mostly," said Lyn Knight, president of Lyn Knight Currency Auctions. "People like to save $2 bills- kind of like half dollars." The Bureau of Engraving and Printing may print 121.6 million new $2 bills in fiscal year 2004, which starts Oct. 1, said BEP spokeswoman Claudia Dickens. "Around July or August we will be able to confirm that number positively," she said. When new $2 bills were last printed in 1996, some 163.6 million of the notes were made. The government stopped making the bills because there wasn't much demand for them from banks and their customers. Cash registers typically don't have bins for the $2 note. "I think people are just saving them. The general population, when something is unusual in terms of money, they pull it and set it aside - `Gee, I haven't seen one of those,' " said David Sundman, a paper money expert and president of Littleton Coin Co. "It is just human nature." Some people like to give them as gifts or use them at $2 betting windows at horse racetracks, a few money mavens suggested. The $2 note can be traced back to the days of the American Revolution, when the Continental Congress issued $2 denominations in "bills of credit for the defense of America," the bureau says. Some experts say there were cases of $2 notes even earlier. The current $2 bill, features the visage of Thomas Jefferson, the nation's third president and author of the Declaration of Independence on the front. On the back of the bill, the signing of the Declaration of Independence is featured. This version of the note came about in 1976 to celebrate the U.S. Bicentennial. Around 655 million $2 notes are currently in circulation worldwide. Even so, "people don't see many of them and aren't used to seeing them," said Doug Tillett, a spokesman at the Federal Reserve Bank of Chicago. "You have to think back to seventh grade civics and think is this legal tender? Is there a $2 bill?" The bureau doesn't have plans to make over the $2 bill as part of its broader, redesign effort. A new, more colorful $20 bill aimed at thwarting high-tech counterfeiters is first in line for the new look and will be put into circulation later this year. The $20 bill is the most knocked-off note in the United States. The $2 bill could became a staple in cash registers and wallets, if the government ever were to decide to give the $1 bill - the most commonly used bill in the United States - the boot, experts said. But barring that unlikely event, the $2 bill - just like the penny - is probably going to stick around for a while, experts said. "It is part of our history," said Sundman. "It is kind of a relic. A survivor."